Complementing the voices of the 360 choristers who comprise the Mormon Tabernacle Choir is the sound of the majestic Tabernacle organ—one of the world's largest and most distinctive instruments. Much more than an icon, the organ and its 11, 623 pipes breathe a warm, refined sound that blends perfectly with the voices of the Choir. Located in the historic Tabernacle on Salt Lake City's Temple Square, the organ is a massive, yet intricate instrument. Together with the Tabernacle itself, the organ is in no small way responsible for the signature sound of this world-renowned choral ensemble. 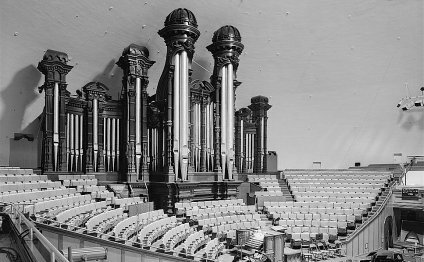 The original organ was built by Joseph Ridges, an English convert to The Church of Jesus Christ of Latter-day Saints who came to Salt Lake City by way of Australia. Ridges' modest instrument, built with old-world craftsmanship and a liberal dose of pioneer ingenuity, was constructed of materials native to the region as far as possible. Though the organ has been rebuilt and enlarged several times during its 135-year history, the original casework and some of Ridges' pipes still remain in the organ today. Currently, the Mormon Tabernacle Choir has a staff of five professional organists: Richard Elliott, Clay Christiansen and Andrew Unsworth assisted by Bonnie Goodliffe and Linda Margetts. The organists accompany the Choir during its weekly radio and television broadcasts of Music & The Spoken Word as well as in recordings and other concert appearances. They also perform daily 30-minute recitals on the historic Tabernacle organ as well as the Conference Center organ in the summer. ​The present instrument was built in 1948 by the Aeolian-Skinner Company of Boston, Massachusetts, under the direction of G. Donald Harrison, president and tonal director of the firm. The organ now has 11, 623 pipes organized into 147 voices (tone colors) and 206 ranks (rows of pipes). The pipes are made of wood, zinc, and various alloys of tin and lead. The pipes are controlled from a console with five 61-note manuals (keyboards) and a 32-note pedal board. Some of the famous gilded cylindrical pipes in the organ's facade are made of wood staves fashioned of native Utah pine, retained from the original pioneer organ built in the 1860s. The longest pipe has a speaking length of 32 feet. The shortest pipe has a speaking length of three-quarters of an inch.